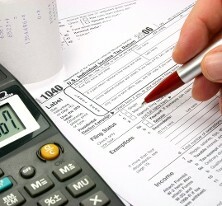 Filling out tax forms is no problem when you turn to Jody H Bridgers Tax & Financial Services in Goldsboro, North Carolina, for individual or business income tax preparation services. Our staff remains the same year after year to build familiarity with clients and their situations. Individuals need to provide an itemized deduction list, investment income, retirement income, information on major financial purchase, and any dependent information. You receive the refund via paper check or direct deposit and have the option to pay our fees out of the tax amount or upfront. Businesses must present income and expense information, payroll, any major asset purchases throughout the year, and access to bank statements throughout the year. Contact us today to ensure you collect the highest possible tax refund.